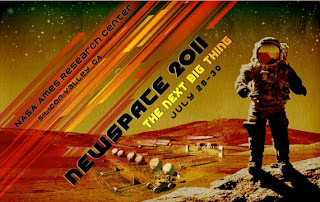 The Google Lunar X PRIZE team spent a few days of last week in Mountain View, CA at the NewSpace 2011 conference -- an annual conference put on by the Space Frontier Foundation. This is an annual gathering of great minds who are passionate about/involved in current and upcoming commercial space activities. If you're looking to hang out with the likes of SpaceX, Virgin Galactic (former GLXP'er Will Pomerantz represented VG on a suborbital spaceflight panel), Sierra Nevada Corporation, NASA, and Google Lunar X PRIZE teams, then NewSpace is your place. This year attracted many government and "big aerospace" entities as well -- the conference itself was hosted at NASA Ames, and representatives from many NASA centers and ATK were present. This led to many panels and hallway discussions about ways that everyone can play nicely together in the same space exploration sandbox; for example, day one of the conference included panels entitled, "Public-Private Partnerships: Back to the Future of Space Development" and "NASA Leadership Roundtable: Commercial Partnerships". As always, there were plenty of interesting updates from the commercial space industry folks -- XCOR alluded to flight tests of their Lynx Mark I suborbital vehicle in the Fall of 2012, Bob Richards of Moon Express unveiled their new "The Moon is ME"campaign and spoke about mini-hoppers on the Moon, SpaceX mentioned their plans to berth with the ISS in December this year, and Virgin Galactic "hopes to be flying to space next year". Welcome to the tipping point of a new era in space exploration, my friends. One of my favorite talks of the conference was from Sean Casey, formally a GLXP team member and now running the "Silicon Valley Space Center" (SVSC). During his talk, he mentioned the importance of getting the tech community (and anyone, really) more involved with the space community. YES. One project that the SVSC is planning is hosting monthly "hackathons" on cubesats starting in October -- which is great, because hands-on activities are one of the best ways to engage people in space exploration. The final panel of the conference was entitled, "The Promise of NewSpace," with our Googler Tiffany Montague as a panelist. She talked about why Google was sponsoring the Google Lunar X PRIZE (to build a new space economy, for education/inspiration, and technical achievement) and added, "Hurry up and get to Mars already. I'm 35!" The audience had many questions for her after the panel, and were certainly interested in Google and their space plans. On a final note, congratulations to entrepreneur (and former Masten Space Systems engineer) Jon Goff, who won the NewSpace 2011 Business Plan competition, worth $25,000!